These puzzles could be solved by supersymmetry, a theory that provides a natural mechanism for protecting the Higgs mass and also has a dark matter candidate. Supersymmetry predicts the existence of “super-partner” particles that are heavier than their Standard Model counterparts. As long as the supersymmetric partners of the Higgs boson, called "higgsinos", aren’t too heavy, then supersymmetry can explain a Higgs mass consistent with current observations. The lightest higgsino, the “LSP” (for “lightest supersymmetric particle”), would be a dark matter candidate, while heavier higgsinos decay to the LSP along with other particles like electrons or muons. Detecting higgsinos can be difficult, especially if the heavier higgsinos and the LSP have very similar masses. In such “compressed” scenarios, the electrons and muons from the heavier higgsino decays have very low momenta, making them difficult to detect. In recent years, ATLAS has made significant progress in understanding these low-momentum particles, which has opened the door to new searches. These latest results exploit unique features of higgsino decays, most importantly how the small mass difference between the higgsinos causes the electron or muon pair to have a correspondingly small mass. In December 2017, ATLAS presented new updates in the compressed supersymmetry search at the SUSY17 conference. These latest results exploit unique features of higgsino decays, most importantly how the small mass difference between the higgsinos causes the electron or muon pair to have a correspondingly small mass, as illustrated in Figure 1. The data are consistent with the Standard Model predictions and have thus been used to set limits on higgsino masses. The new limits are shown in Figure 2, along with limits from another recent ATLAS search that probes SUSY models with even more compressed spectra. For the first time, these LHC results surpass constraints set in 2004 by the Large Electron Positron (LEP) collider that was hosted in the same 27 km circumference tunnel that now holds the LHC. As many of the still viable supersymmetry scenarios have very small higgsino mass differences, there remains plenty of room for investigation. Look forward to new searches of the compressed frontier as ATLAS continues to collect and analyse data from the LHC. Search for long-lived charginos based on a disappearing-track signature in pp collisions at 13 TeV with the ATLAS detector (arXiv:1712.02118, see figures). 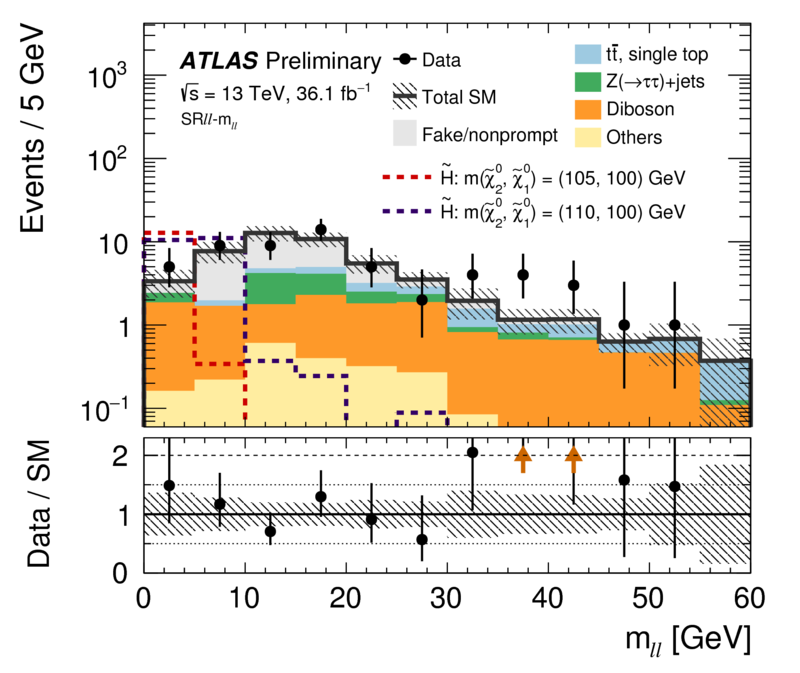 Search for direct pair production of higgsinos by reinterpretation of the disappearing track analysis with 36.1 fb−1 of 13 TeV data collected with the ATLAS experiment (ATL-PHYS-PUB-2017-019, see figures). SUSY17 presentation by Joseph Reichert: Search for compressed SUSY scenarios with the ATLAS detector.